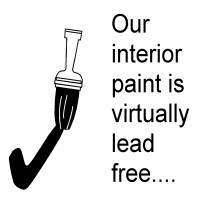 Lead has received national attention for problems in young children, most notably those who have ingested paint chips. More recently, the media has carried research reports describing possible effects on adults. The maintenance of painted surfaces containing lead is covered by various federal and state regulations to minimize exposure to persons of all ages. Our procedures, and those used by painting contractors, are required to comply with these applicable regulations. Lead pigments were used in some, but not most, paints through the early 1970s. 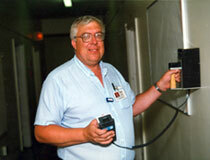 In fact, the vast majority of interior surfaces tested within the residence halls continue to be found to be lead-free. Interior painted surfaces in our North Campus halls are, practically speaking, lead paint free. When lead paint has been found on the inside of our buildings, it has been largely limited to the painted trim on closets and around doors or windows in a few but not most North Hill residence hall rooms. Also, lead paints have been found on the outsides of buildings, such as columns and the trim near roofs or the exteriors of doors and windows. Exterior painting of residence halls is generally restricted to the summer months when the buildings are unoccupied. When this work does occur, either in our residence halls or other campus buildings, you will see the entrances of buildings and the surrounding grounds covered in plastic to prevent the paint chips from falling on the ground or passing pedestrians. Our staff can test for the presence of lead in previously painted surfaces. Or, samples will be sent out for analysis by certified labs. Painting of lead-containing surfaces will likely be held until proper abatement procedures can be followed. Lead-free surfaces are scraped and painted without any special precautions. Media attention in recent years has also highlighted the presence of lead in water from solder used on copper pipes or from lead pipes in some city water systems. Campus underground water lines have never been found to be made of lead pipes. Very minute traces of lead have been found to be released into water after a pipes are joined using lead-containing solder. Immediately after soldering and filling the pipe with water, a thin coating of oxidation begins to form on the joint that significantly reduces but may never eliminate this trace release of lead. Only a handful of our oldest, buildings that have not been renovated were built using galvanized water supply piping. As with most older buildings, repairs over the years have been made with copper pipe in lieu of using galvanized pipe. Solder used to join copper pipe sections and fittings contained lead through the late 1980s. As soon as no-lead solder became available, our maintenance program and outside contractors switched to its use. Allegany, Anne Arundel, Charles, Frederick, Howard, Montgomery, St. Mary's, Somerset, Washington. Except for the nine of our halls noted above, the majority of residents should assume that some if not all domestic water is supplied through copper pipes joined with solder containing lead. Media attention several years ago also focused on lead solder used in the internal components of certain manufacturers' water coolers and drinking fountains. A list of the units assembled using lead solder was compared to those models used in residence halls. None of the affected models were found. Residents should use their own judgment in following the advice provided by health officials, namely, water for drinking or cooking should run for a minute to flush out the water that sat overnight in a copper water line. FYI -- When the campus Environmental Safety staff has sampled drinking water on campus, none in residence halls has ever been found to contain elevated levels of lead!! !